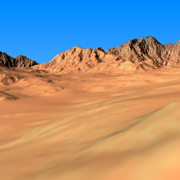 The island in the above screenshot is rendered with the landscape layer. What can I do with the landscape layer? 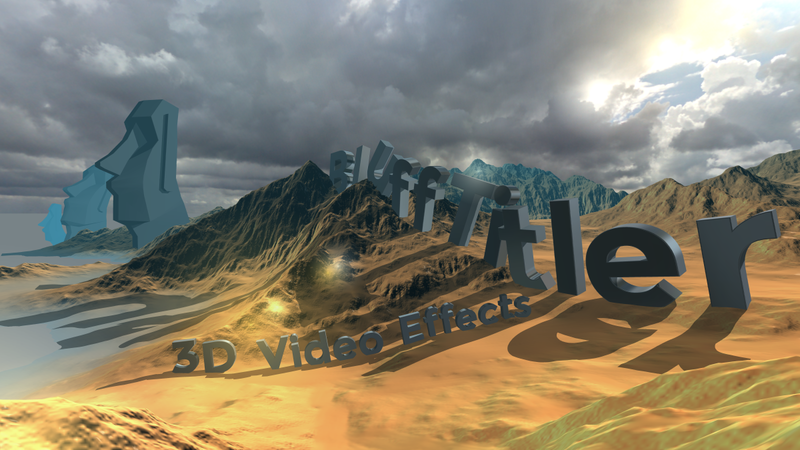 With the landscape layer you can render landscapes. How do I create a landscape layer? Choose LAYER > Add layer > Add landscape layer... to create a new landscape layer. The new landscape layer can be selected from the layers dropdown to make it the active layer. The installer comes with shows demonstrating the possibilities of the landscape layer. Choose FILE > Open show... and select a show from the BluffTitler/Media/Shows/Landscape folder. Make sure to export the displacementmaps as 16 bits. 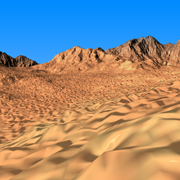 With 8 bits displacementmaps the surface is not smooth. 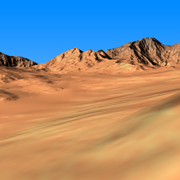 The limited height resolution creates terracing. 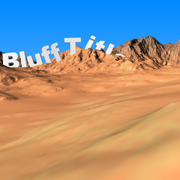 BluffTitler uses DirectX 11 hardware tessellation. This makes low details visible. You can control the amount of tessellation with the FX Displacement detail (tessellation) property. A low value looks like this. The best results are achieved by combining displacementmapping with colourmapping. 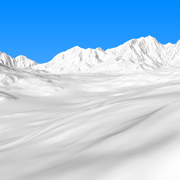 Without a colourmap, the landscape looks like this. Choose LAYER > Stand in landscape to make your layer stand in the landscape. The vertical position is now relative to the landscape surface. The position of the landscape. The size of the landscape. The colour of the landscape. The specular colour of the landscape. The transparency of the landscape. The number of times the texture is repeated. This property can be used to solve sorting problems. When the water and landscape layers are placed at the exact same position, you can force the transparent water to be rendered on top of the landscape by setting the Depth bias property of the landscape to 1. A higher value makes the rotation of layers standing in the landscape (using the LAYER > Stand in landscape menu item) less sensitive to small details.